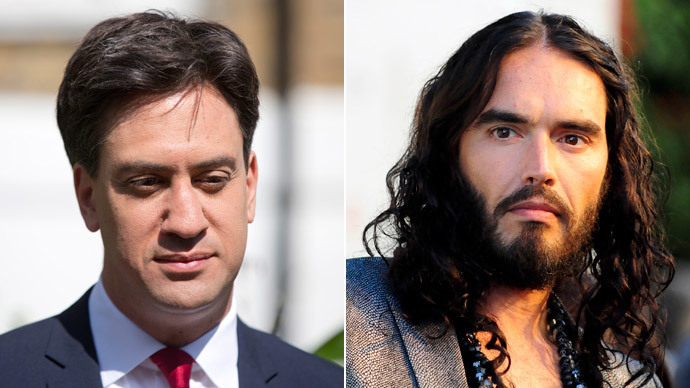 Labour Party leader Ed Miliband has defended Russell Brand’s anti-voting message, saying the comedian reflects a widespread antipathy to politics. While Miliband insisted he does not agree with the comedian-turned-activist’s call to ignore the election, he believes Brand’s popularity reflects what many people are thinking. Brand has come under fierce criticism for calling on young people to turn their backs on elections. The BBC’s Political Editor Nick Robinson called Brand a “sanctimonious t***” after the comedian refused to be interviewed for a Radio 4 program about democracy earlier this year. In an interview with Shortlist magazine, Miliband said, “I definitely want people to vote – and I want people to vote Labour, obviously – but it’s really important that we engage people in the election. “People criticize Russell Brand, and I don’t agree with his message, but what he’s saying, a number of people are thinking. Which is that politics doesn’t feel like it speaks to them,” he added. Brand says he refuses to vote because politicians are untrustworthy and irrelevant. “Don’t bother voting. Stop voting, stop pretending, wake up, be in reality now. Why vote? We know it’s not going to make any difference,” he told the BBC. Robinson told the Radio Times, “You see I've got a bit of a beef with Brand. More than anyone I can remember in recent times he has energized, excited and enthused people about some of the great issues of our time. Historical voting trends reflect Brand’s rejection of the ballot box, however. According to research by UK Political Info, voter turnout figures have seen an overall decline since the end of World War II. Some 72.8 percent of eligible voters cast a ballot in the 1945 general election and 83.9 percent in the 1950 election. Compare those figures to 65.1 percent in the 2010 election and it appears the public is more disillusioned with politics in the 21st century than at any time in the past 70 years. Voter turnout has been increasing over the past three general elections, however. The highest proportion of respondents, 40 percent, believed it applies to no political party. A survey by Survation in September 2013 took a detailed look at the attitudes of non-voters. When asked, “What would you say were your main reasons for not voting in the last the election?” over half of respondents expressed disillusionment with contemporary politics. Miliband’s defense of Brand follows less-than-flattering comments made by the comedian about the Labour leader. Speaking to Huffington Post UK in November 2013, he said, “I think we could do better. No seriously, I do think he is really kind, and it sounds like his Dad was wicked,” in reference to the Labour leader’s Marxist intellectual father, Ralph Miliband.